‘Lamp’. No label, simple system, probably beginning of 20th century. Bought it cheap in miserable condition on a market. Gave it an overhaul to find out it’s tuned in B natural. I couldn’t throw it away, so I made a lamp out of it. ‘No name’. Totally anonymous. No traces after any labels. But it was cheap!!! 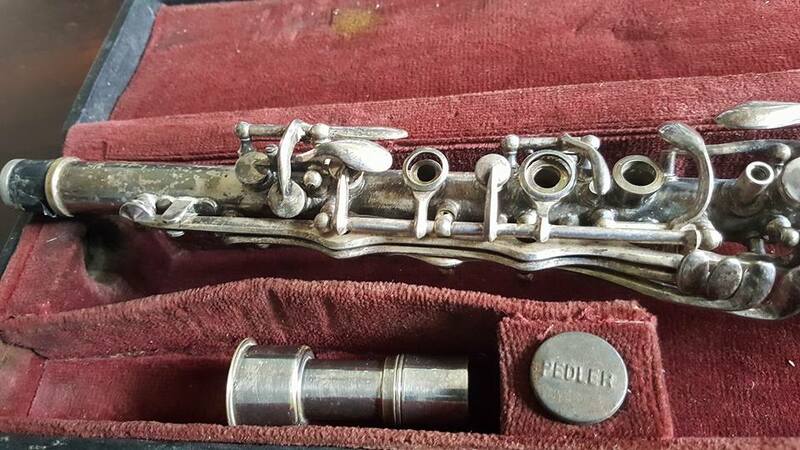 My first Albert clarinet. I got it shortly after my first recording of George Lewis, came as a set of A and Bb. A friend sold them to me for 6 beers. ‘Penzel Müller’. A powerful clarinet made by German immigrants in New York. Still one of my favorites. Unfortunally it’s slightly out of tune. According to the serial number, it should have been made in the beginning of the 1940s. A great friend of mine, and sponsor to several of my clarinets, Mogens Møller Jensen bought it for me in New Orleans. Chris Burke sold it to us with a barrel way too short. I had to replace it by a Buffet to get it in tune. After the bell cracked, I got an A. Andersen bell to fit (no idea who he is). That means only the body is Penzel Mueller. It seems like George Lewis liked the Penzel-Müller clarinets as well. Read thisinteresting article by Eberhard Kraut. ‘Buffet Crampon’. 1914. A lovely instrument. A classic Albert with the characteristic wrap-around ‘octave’ key. I played it for a couple of years, altering the Buffet. The intonation is perfect – unfortunately the tone is unsuitable for jazz. That made me stars the search for a combination of the two…I don’t have this clarinet anymore. It was used as payment for my latest Selmer. After a year of investigations I found the solution: ‘Selmer’. Six months after my preferred model showed up at eBay. Almost perfect. Low pitch, big bore, 4 rings. The best keywork I have ever seen. A funny thing about it is the low Eb. Quite unusual and annoying, but I’ll get used to it. K-series from around 1924, old logo, in original case – previously owned by a member of “Fat Waters and His Danceonians” (whoever they were). This one has been sold. ‘Selmer’, M-series from 1939. While I was bidding on the K-series, my friend Mogens turned up with a Selmer he bought a few years ago. My earlier attempts to wrest it away from him had been in vain, but now he asked me to check it out for him. “Something is wrong when it’s getting warmed up”, he claimed. Fantastic tone, but the key-work is not the most elegant. There is a third ring for the left hand, and I can’t figure out what it is good for. Nothing wrong whatsoever! I liked the K-series better, so I returned the clarinet back to my friend. In October 2018 Mogens decided to give it to me… Thank You Mogens !! ‘Selmer’. K-series from around 1927. New logo. Dating the K-series is only approxymate, as Selmer didn’t keep any records on the production. But we know they changed the logo in 1926. I know that K 3633 has got the new logo, and K 3488 the old logo . 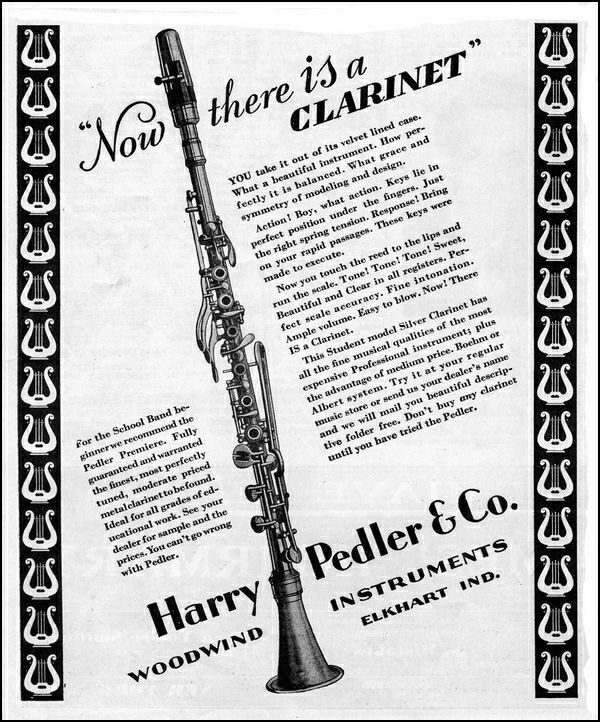 More info on logos, and how to date your Selmer clarinet here. ‘Harry Pedler’ Premiere. 1933/34. 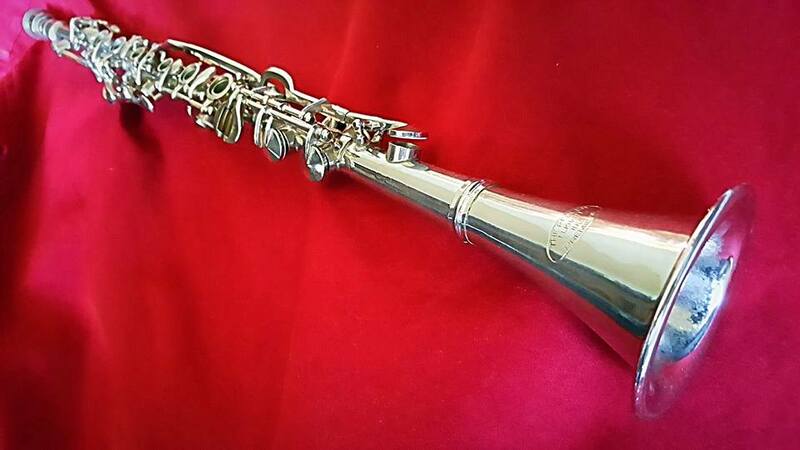 Albert system metal clarinet which I got in exchange for a piccolo flute. Good for outdoor use, as wooden clarinets are not too fond of bad weather conditions. George Lewis used to play a similar model back in the 1940’s. Read this exciting article in German by metal clarinet expert Eberhard Kraut. Street parades. What to do? Thousands of clarinet players showing up. PLAY Eb!!! Nobody plays Eb anymore, even it was standard in old New Orleans. A good way to annoy the trombones in front of You, though!?! I believe it’s a ‘Forté’ from the Czech Republic. That is a guess – the logo is almost worn out. A Pedler Hoosier from 1952/53. 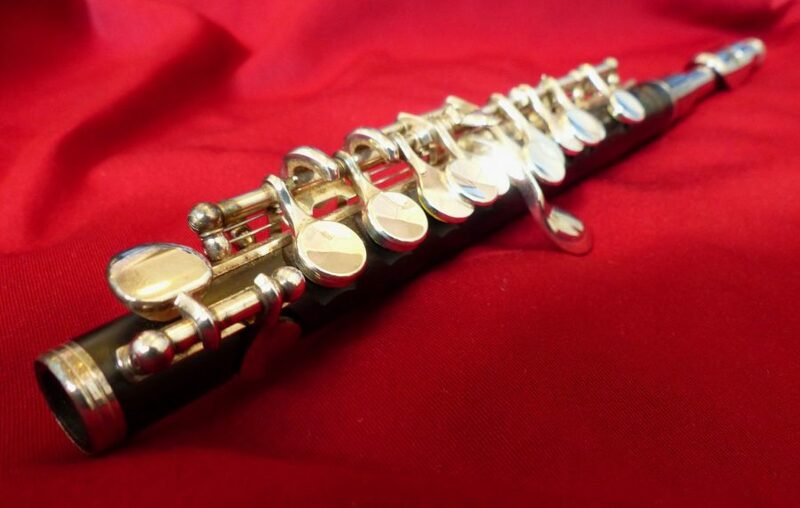 It’s a Boehm system clarinet. Again, I bought it in terrible condition, thinking I could save the screws as spares for my Pedler Albert. I started to clean it, give it new pads and cork, and all of a sudden i had a beautiful working clarinet. Now I would like somebody else to own it and play it. That’s why I’m selling (I don’t play Boehm system! ).